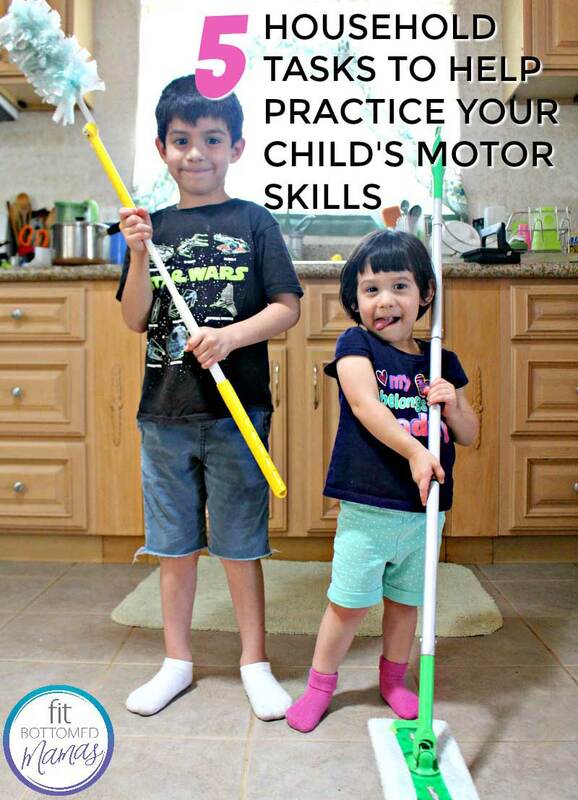 Motor skills are something that we can help our children exercise at home. I don’t have a written out motor skill curriculum for your children, but I would like to share with you some examples of how I exercise my children’s gross and fine motor skills — while getting the most out of their help. I’ve found that disguising lessons in things that my young children want to help me with — that they won’t want to do when they are teenagers, such as household chores — removes a layer of frustration for me, because my children want to help, plus I’m not nagging them to practice whatever fixed lesson I have spent time organizing for them. This may be a simple no-brainer task for us adults, but it actually requires more coordination than we think. I don’t know why it’s such a fun task for my 2-year-old, but it is, and I don’t mind because it’s exercising her muscles and coordination skills. If you feel your little one is old enough to do this, it may just make them feel so grown up and important. Keeping the dustpan in place takes commitment and focus. This may cause your child some frustration at the beginning, but when they finalize the task, the sense of accomplishment in their face is unmistakable. I don’t know about your kids, but my kids love handling the silverware. (Maybe because all they get to use are the plasticware from Ikea.) Sorting silverware is another task that takes focus because forks go with forks and spoons go with spoons. My children’s help doesn’t lessen the amount of housework because, let’s be honest, children plus chores equals more work. And with that in mind, I want to encourage you to be kind to yourself and your children if these tasks are challenging at first. Showing your child how to do anything for the first time requires patience. But trust that, with patience and love, that frustration will become endurance and strength, which is exactly why I practice my child’s motor skills.